SO MUCH YARN, SO LITTLE TIME! : Sockapla2za's are ready to go! Sockapla2za's are ready to go! Assembling the package. Socks...check....extra yarn...check...sock sleeve...check. I can't wait to see who knit my socks and what they are like...I will love them. 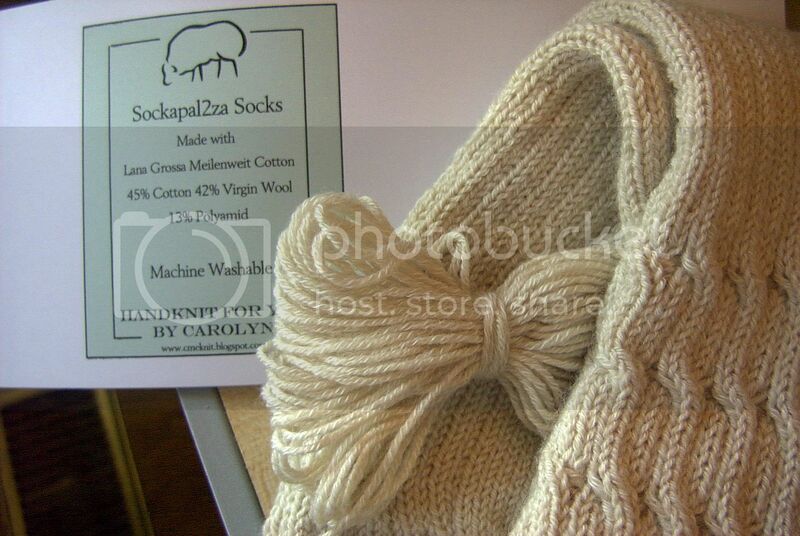 I know you are reading dear sock knitter....I can't wait! I now feel like I am in the loop. This book is fantastic, I don't know why I didn't have it. Mind you I could never find it in person, I had to order it on line. The second footlet is on the go and going just fine. We have a heel now. Peter Pan is complete....but the sewing machine has some kind of a bobbin problem...it's skipping all of a sudden. So captain hook won't make it in time. That's ok, I'll get it done after the weekend when the machine has had a tune up. Oh, I love that sock sleeve! I might have to steal that... I was just thinking of making a little tag, but a sock sleeve is so much cooler :). Thanks for the idea! I'm with Grumperina - awesome sock sleeve. What a great way to package socks as a gift. And I love the color - I'm such a basic gal. So, do we get to see pictures of Peter Pan? Your little sleeve is totally cute. I also may have to steal the idea. Glad the footlet is going better! Good luck getting the sewing machine working better. Love the sleeve! Very clever and professional looking! 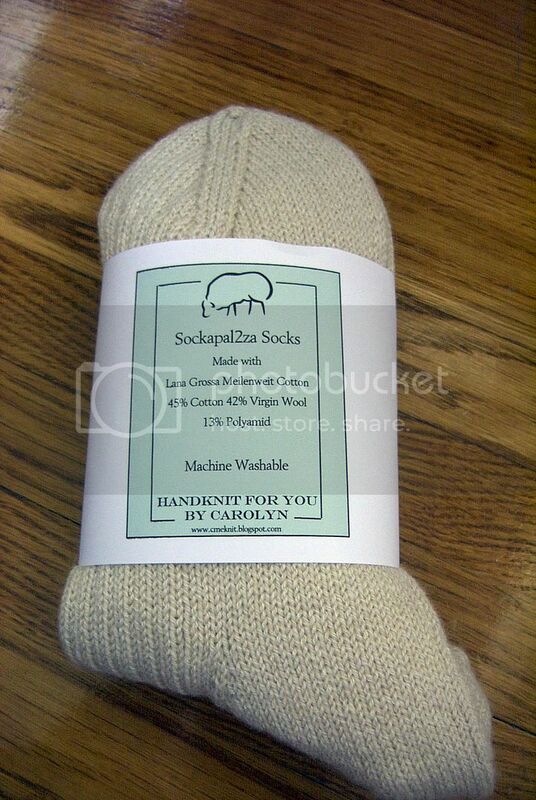 that is such a nice little way to make the socks a real treat--love that sleeve idea ;) they are beautiful, carolyn! oh i love the sock sleeve!! did you make it yourself? 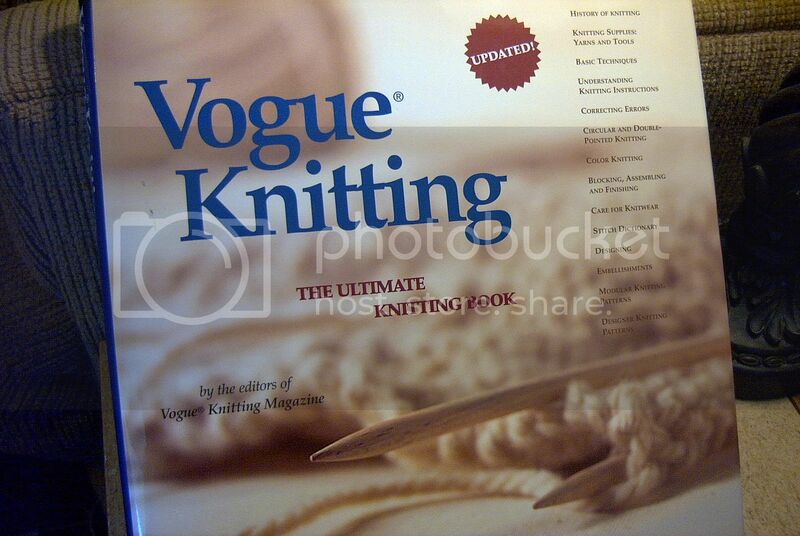 vogue knitting is a great book, you'll love it. What a great label for your socks. Look at how awesome those socks turned out. Love the packaging too!!!! It's already been said, but I'll say it again...love the sleeve! The socks are pretty great too! I too love the sleeve idea for the socks. I have blatently stolen it from you, but wanted to let you know! The socks are great. The sock sleeve's even greater. I already picked up your idea after seeing it at Grumperina's blog.